Late last month, the Centers for Medicare & Medicaid Services (CMS) issued a proposed rule to modernize discharge planning rules for nursing facilities and other providers. The intended result of these changes would be better quality of care outcomes. 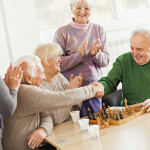 The rule would also implement the discharging planning requirements of the IMPACT Act, requiring that home health agencies and other providers use data collected to assist patients during the discharge process, taking into account their preferences for treatment and goals for care to ensure continuity. The process would help patients/caregivers with selecting the right post-acute provider, since quality measure data and resource use measure data would be provided by the transitioning providers. The proposed rule, “Medicare and Medicaid Programs; Revisions to Requirements for Discharge Planning for Hospitals, Critical Access Hospitals, and Home Health Agencies,” was published in the November 3, 2015 Federal Register. There is a 60 day comment period open. Read the press release, “Discharge Planning Proposed Rule Focuses on Patient Preferences” on the CMS website.